To create interesting CrossNumber puzzles requires some imagination. And of course, a computer couldn’t hurt! You might want to print out squares or cubes, or more complex arrays of numbers — then look for patterns or digits in common. It’s not hard to do this in Python. Click on the following link to see the number generating routines used in today’s post. These are simple patterns — you’ll need to learn more about programming if you want to investigate more complicated relationships. But the online help for Python syntax isn’t too bad, so you can experiment freely. I’ve included one additional example in the worksheet. 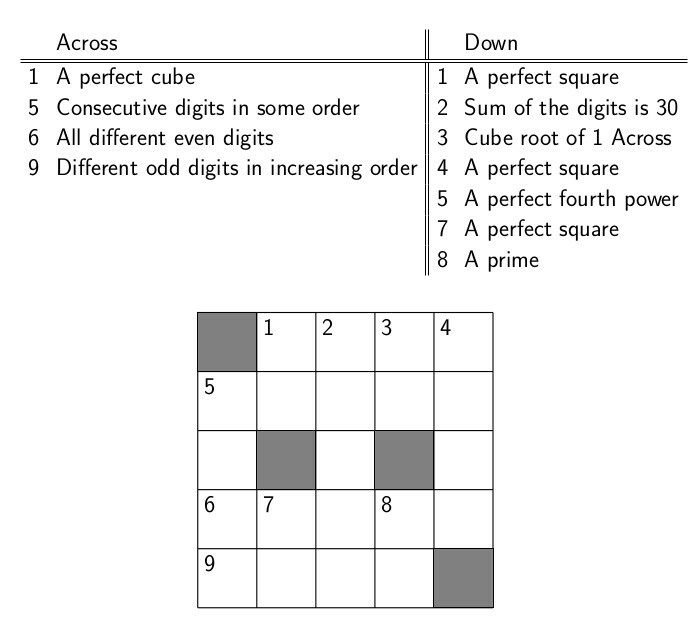 In creating CrossNumber puzzles, you might want to look at a particular digit of a number. So if you wanted the third digit from the right, you could use integer division in Python: 12,345 // 100 is just 123. Then to get the 3, you use modular arithmetic: 123 % 10. This will automatically result in a third digit of 0 if the number is less than 100. This routine can be adapted to find any digit of a number (from the right), as is also done in the worksheet. You can also try writing routines which extract digits from the left, or middle digits, or…. 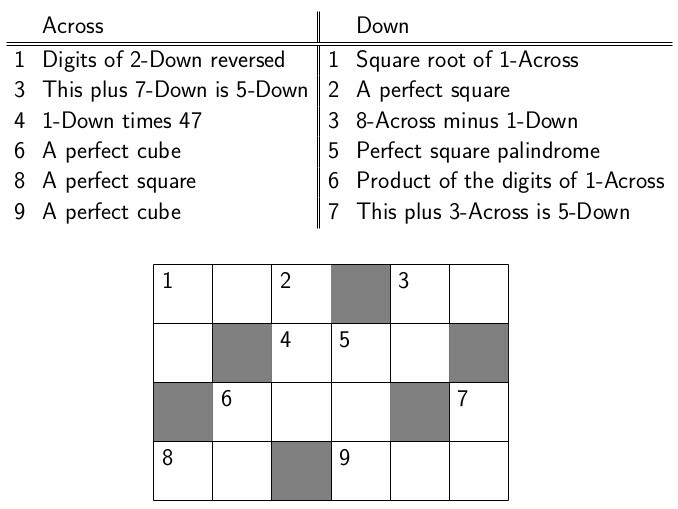 Just for fun, here’s another CrossNumber puzzle for you to solve.